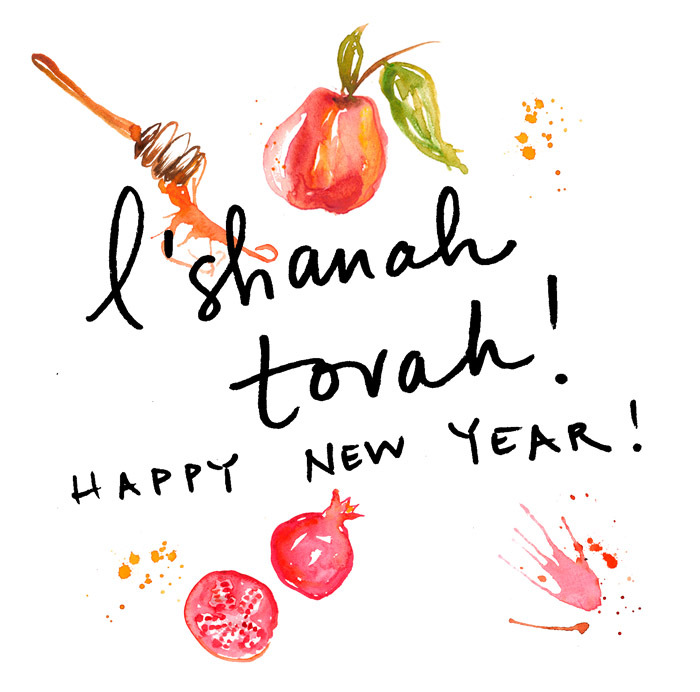 Rosh Hashana, the Jewish New Year, is this week and I am planning our holiday menu! We are hosting a big dinner at the cabin on Friday and I am planning to make baked apples for dessert. Growing up in the apple orchard, we made these when I was little and they remind me so much of Fall. You can really fill them with anything, but I usually do a mixture of butter, dried berries, raisins, dried chopped figs, nuts, cinnamon and brown sugar. Stir all the ingredients together, spoon them into cored apples and bake at 350 degrees F, for about an hour. (I do an hour and 15 minutes to get very soft apples). Serve warm drizzled with honey alongside vanilla ice cream. For more photos and the full recipe check out my post for Better Homes and Gardens today. The Jewish holiday of Yom Kippur is this week, which continues the season of the Jewish New Year. To celebrate this annual cycle, challah is often formed into a round (instead of being braided) and harvest type foods, like pomegranate, are often eaten. I combined these ideas into a sweet bread, baked with lots of honey and pomegranate seeds. You can work the pom seeds into the dough itself, or just sprinkle them on the top, or both! Put one packet of yeast in a bowl with ¾ cup warm water and let it sit for 5 min until it gets a little bubbly. Then toss in an egg, 1/3 honey, 2T brown sugar, a big pinch of coarse salt and a half stick melted butter. Mix it all by hand or using a mixer. Then add flour, little by little until it’s no longer sticking to the side of the bowl and is thick and doughy and doesn’t seem to absorb any more flour (you’ll know…). You usually need about 4 cups of flour. Knead it for a couple minutes (or just let it go around in the mixer with the dough hook) then throw that lump of dough into a big bowl you’ve coated in oil, and cover the top of the bowl with saran wrap. It’ll rise to about twice the size in a couple hours. Then take it out, roll it into a snake, then coil it into a round. Sprinkle with pom seeds and brush with egg (optional, but makes it feel more official!). Let it rise on a cookie sheet for another 45 min or so, then pop it in the oven for about 25 min at 350 degrees. Check it once in a while to see how brown it’s getting, and tap it on the bottom to see if it’s done (it should sound kind of hollow). Enjoy! The Jewish holiday of Rosh Hashana starts today which marks the beginning of the New Year on the Jewish calendar. To sweeten the New Year it is traditional to eat apples and honey and round foods which signify the annual cycle. To kick off the High Holidays, we have a couple of big meals with friends and family and this year I am making this apple and honey galette. It’s an easy dessert and you only need 2 apples! You can really use any kind of soft cheese, but I used brie. Serve it warm or at room temperature.